Eleven players took the court for the Trojans in their 76-62 home victory over Cal State Fullerton Tuesday night. However, senior guard J.T. Terrell was not among them. According to head coach Andy Enfield, Terrell did not get any playing time due to his performance in the classroom. Tonight’s lack of playing time comes a week after Terrell was pulled from the starting lineup, again due to academic reasons. 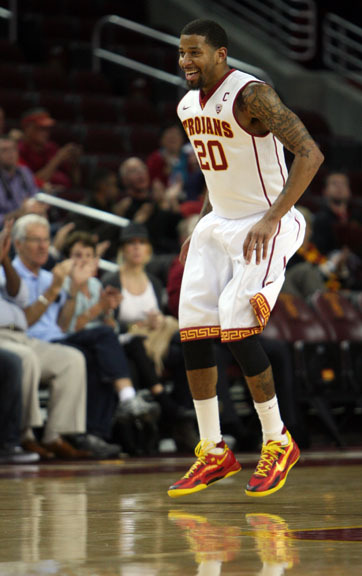 Terrell started and played 34 minutes in the Trojan’s opening night loss at Utah State. However, when the Trojans returned to Southern California to begin their four-game home stand, they did so with Terrell coming off the bench. In USC’s home opener, Terrell was replaced in the starting lineup by freshman Julian Jacobs, who scored 9 points in 24 minutes of action. Terrell did play 19 minutes in the home opener, where he scored 8 points and added 5 assists and 5 rebounds. His minutes continued to decline in USC’s second home game against Northern Arizona. Terrell only played 17 minutes in the Trojans’ narrow victory over Northern Arizona last Friday and he had only two points. Today, Terrell spent the entire game wearing his warm up jacket and sitting on the middle of the bench, despite the fact that he was eligible to play according to Enfield. However, Terrell is still practicing with the team, and Enfield said he could still see playing time on Thursday when the Trojans take on West Alabama. “We will make some decisions here in the next couple of days about his short term eligibility or his standing within the team,” Enfield said. Following Thursday’s game, the Trojans will travel to The Bahamas to participate in the Battle 4 Atlantis tournament. USC will face their first major tests of the season there, when they take on teams that are widely considered to be NCAA tournament contenders this season, including Villanova and Kansas. Terrell had several big games last year when the Trojans faced Top 25 competition, with 14 points in USC’s home upset over then-No. 11 Arizona and 10 points in the USC’s win at UCLA. Still, USC has one game to play before thoughts turn to the Thanksgiving tournament, and Enfield said he has not given any thought yet to the Battle 4 Atlantis. “We talk about game by game and we will not talk about that tournament until that game is over on Thursday night,” he said. With the Trojans taking everything game by game, it remains to be seen how much playing time Terrell will see in the game on Thursday. However, it is clear that Terrell has the support of his teammates and coach.